What’s topped with icing Infinity Stones and maybe spoils who dies in Avengers 4? This huge Thanos cake! No matter which way you slice it, desserts filled with spoilers are undoubtedly my favourite treat. For those of you who are either A) vegan and B) want nothing to do with Avengers: Infinity War or Avengers 4 spoilers then it’s probably best to look away now. Here be news of potential deaths. Everything after the Thanos GIF is possibly dark and full of spoilers. So, here’s the deal: directors the Russo Brothers snapped a pic of Avengers 4’s wrap party cake. Thanos features with tasty Infinity Stones. So far, so normal (and pretty darn impressive). But wait, what’s that holding up Thanos’ layer of sweet treats? Again, this could all just be nothing but a baker having a little fun but cakes are serious business, people. The plot thickens, however, as people on Twitter have got their detective hats on. 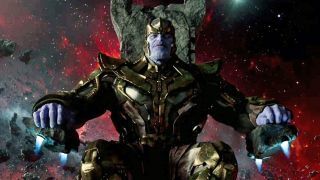 See those claws behind Thanos? That’s Black Panther. Surely he doesn’t die in only his fourth appearance, right? What do we reckon? A delicacy designed to throw everyone off, or something more than that? If nothing else, I want to know what the Time Stone tastes like. I’ll bet it’s minty. For more on Avengers 4, check out Cap wearing his original suit in new set photos. There's also a look at everything you need to know about Infinity Stones, including whether they're edible. (Spoiler: They're not).